Mutli angle template tool is a perfect tool for measuring and creating specialized shapes within seconds. The tool is upgraded with made of Aliminum Alloy and laser etched marking. Four long arms give you more flexibility for measuring bigger shapes. It is an essential tool for anyone who is a professional or DIYer. Mutli angle template tool gives you advantages to accurately measure any angle and shape on your work area. All parts are long size. It gives you more flexibility for bigger size. It is easy to use. You just need to place the tool on your work area and slide the rulers according to your shape and thighten the knobs. Then, you can use it as a template. The template tool has laser etched scale marking and it has more resistance aginst erasing than normal print. Aluminum alloy material does not rust and has more durability than the plastic ones. Angleizer is multifunctional. Handyman, Carpenter, Craftsmen, Builders, Engineers, DIY-ers, etc. can use this tool at their work to improve accuracy and speed. So they can save time. 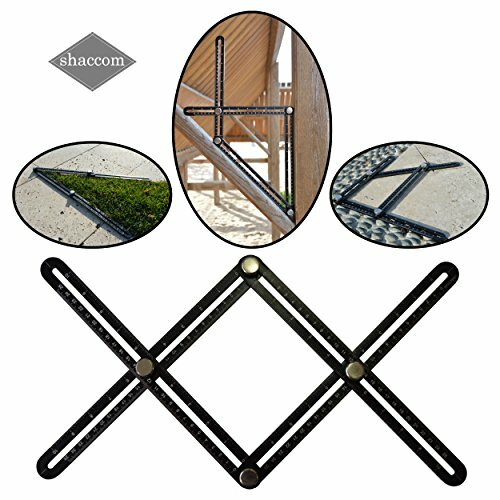 If you have any questions about this product by shaccom, contact us by completing and submitting the form below. If you are looking for a specif part number, please include it with your message. Multi Angle Measuring Ruler by OffiCreative | Multi Function Black Colored Plastic Layout Template Tool | with Water Balance as Gift. Multi angle measuring ruler with 4 sided adjustable ruler Aluminum Alloy angle expert tool measure all angles and forms perfect for craftsmen engineers wooden worker and DIY-ers.